Gypsy Scholar: Annoying Game Theorist? 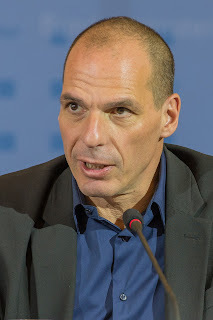 I think the Greek government, led by the left-wing Syriza political party, selected Yanis Varoufakis to 'negotiate' for better conditions in the austerity program because he is an expert on game theory, but game theory presupposes conflict between antagonists, a kind of words warfare, so just imagine the message that the Greek government was sending in making Varoufakis their champion, for in doing so, they showed the EU that they would be fighting against austerity to the last millimeter of terms rather than discussing how to make the austerity program workable, a hint of hostility that instantly alienated the EU, particularly since many in the EU had already come to the point of scarcely any longer caring whether Greece had to leave the euro zone or not, meaning the EU states felt they could not lose, no matter how skillful Varoufakis should prove to be in game theory, because the endgame no longer mattered. Once the Greeks realized this, Varoufakis dropped out, and Greece began to negotiate in earnest, Or so things seemed to me, but what do I know about any of this? I think you're on to something here Professor Jeff. I'd appreciate reading further where you might lead. You know Europe far better than I; my thinking far as Greece is concerned has more to do with what I think now more likely than I did a year ago - Assad is likely to fall [probably around "the Western World's Christmastime" I'm positing] which will make the result the more terrible. And Russia ... well Russia's more or less Orthodox isn't it? The Black Sea Fleet once it loses the Mediterranean base Syria offers at Tartus will need to be ... uhm "replaced" ... a handy place would be the Aegean no? I see via Reuters Russia is about to run direct pipeline fuel deliveries to Greece. I wish America's *Statesmen*/Politicians were more forthcoming about what "The Plan" is - this stuff where everybody is running around [maybe] blind tasks my attention. Game Theory looks to be pretty damn brutal when it goes onto practice. Interesting remarks, providing a key that -- in Italy, at least -- apparently was not noticed by the media. HD, I probably won't be following up the game theory speculation since I don't know it well enough not to make a fool of myself doing so . . . I'm glad it was of some worth despite my lack of expertise.